If you’ve read accounts of what everyday life was like in ancient civilizations, you’ll get the impression that most people, apart from the privileged, lived in a perpetual state of chaos, squalor and degradation. The living conditions were poor and so were the hygienic standards. Despite these dire living conditions, the natives managed to maintain an unwavering sense of idealism and enchantment. Just visit any one of the stupendous relics of history, such as the Pyramids of Giza, Stonehenge, or the any rustic church or castle scattered all over Europe, and you’ll be convinced of the ancient’s yearning for beauty, and a passion for myth, folklore and fantasy. For them, material things and objects in nature were alive with magic and possessed a kind of spiritual essence to which they felt connected. A sense of enchantment and wonder naturally permeated every aspect of their life. Ever since scientific reasoning and advancement took hold of our global society, we’ve become increasingly rational. Along the path of progress, we lost our connection to a deeper and more profound realms of existence. As much as technology has helped us to stay connected to each other and to be on top of things, it has also eroded our sense of wonder. We have become accustomed to living a boxed-in and routine existence that deprives us of experiencing the splendor that lies beyond the walls. This is worsened by the rough experiences that we some of us have endured while growing up. Our spirits become calcified with fear and negativity. Children, on the other hand, live in a perpetual state of awe because they see the world with openness and innocence. They revel in the novelty of every experience and see it as an opportunity for fun. This truth reminds me of a beautiful scene from the movie Hook, where Robin Williams, who plays a grown-up version of Peter Pan, returns to Neverland after many years of living as an adult on Earth. In this scene, he sits at a large banquet table with the Lost Boys, waiting for their food to arrive. When it does, he is bewildered as he watches the boys dig into an elaborate spread of invisible, delectable treats. The story of Hook exemplifies the importance of connecting to our inner child. The world is full of wonder and majesty but we have to train ourselves to be able to acknowledge it by slowing down, living moment-to-moment, and being curious about what’s out there – just as kids do. When you give yourself permission to revel in a state of awe, your life will go from black and white to Technicolor. There will be a vitality and vibrancy injected into your existence. Your creative prowess will get magnified as you begin finding more purpose and joy in your daily activities. Every object, creature and person will vibrate with an aliveness and primal force. Fostering a state of wonder is something that can be easily cultivated within you but it may require a shift in your thoughts and lifestyle to make it possible. You have to be in an optimum environment with a suitable frame of mind to elicit those subtle, ephemeral sensations within yourself. 1. Adopt a beginner’s mindset: There’s a belief in Zen Buddhism that states that in the beginner’s mind, there are many possibilities, but in the expert’s, there are only a few. When we view life from a beginner’s perspective, we are curious and receptive to new ideas. When we break out of our limitations and mental ruts, we open up a doorway within our mind, through which magic can enter. Attempt a new way of doings things or challenge yourself by trying out new activities such as dance classes, cooking a new dish, or even exploring a different route to work. 2. Spend more time in nature: Native Americans have always had a deep respect for nature. They believe that if a man spends too much time away from nature, his heart grows hard. They recognize the splendor in the natural scenery that surrounds us, such as the beautiful night sky with stars that sparkle like diamonds, all the unique kinds of animals and plants that populate the Earth, and the magnificent landscapes that take your breath away. Make a point to spend time during your week in a natural setting, be it a garden, park, beach or the woods. 3. Engage in the arts: There’s no doubt that art is one of the best gateways to experiencing profound emotions, including awe and wonder. If you’ve ever listened to a melodious tune, witnessed a masterpiece painting, or watched a performance that enchanted you, you’ve had the opportunity to enter this state. Choose to spend as much time as possible engaged in the arts that appeal to you the most. You can also involve yourself in a creative endeavor such as writing, singing and dancing. 4. Make time for rest and reflection: A perpetually busy and preoccupied mind will not be able to pick up on the subtle beauty in the world. An individual with a frazzled nervous system does not have the capacity to see magic. This necessitates the need for us to take regular breaks amidst the busyness of our lives. We need to carve out time for activities that calm us down, such as meditation, yoga, easy reading, deep breathing, or some internal reflection within a quiet space. 5. Be open to seeing magic: Most of us have become rational thinkers because of all the conditioning that we’ve been through over the years. For this reason, we need to re-train our minds to get comfortable with dealing with the ambiguous and ethereal. Most people are able to do this by adopting a spiritual bend of mind, either through formal religion or through their own personal philosophies. A spiritual thought process and philosophy will enable you to see the big picture, suspend your disbelief, and give you the insight to look beyond your material existence. Astronomer and astrophysicist Carl Sagan once said that the only way for small creatures such as ourselves to appreciate the vastness of the Universe is through love. I believe that love is ultimately at the heart of everything that exists in the Universe. It’s a reverberating cosmic force which all of us can soak in, if we choose to do so. 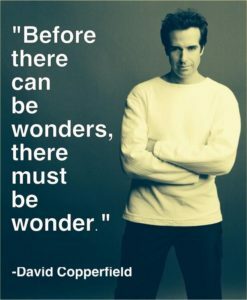 Question for you: What are some action steps that you can take towards experiencing wonder in your life? It is easy for me to experience wonder every day. I have a 4-year-old son who is a miracle child since he was not expected to survive delivery and I have a husband who is a cancer survivor. So just having them with me every day and seeing their smiles and hearing them laugh and having time with them is a wonderful and awe-inspiring experience. thanks Seline. I really needed to read this as my life does seem so boring and dull at the moment. i need to start seeing the world with fresh eyes…. Wow so nice post!! Thank you for sharing with us Seline!